What most web conferencing providers fail to disclose is the fact that participants are required to download their software in order to attend an online meeting. This can cause a myriad of obstacles and headaches for everyone involved. When participants attempt to join a meeting and are unknowingly instructed to download foreign software, there is often an overwhelming sense of unprofessionalism conveyed. Requiring participants to download software for your benefit can reflect poorly on you and your organization. Onstream Webinars makes it easier than ever for participants to join your online meetings. 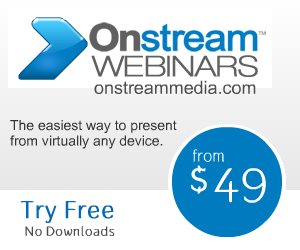 Onstream Webinars is 100% browser driven and download free. Participants around the globe can simply follow the room link provided to them and gain instant access to your meeting. Why make it difficult to reach your audience with software downloads when you can effortlessly use Onstream’s award winning technology.